With the news so full of tragedy and violence, it can be easy to lose your faith in humanity. Sometimes, it seems like people are always doing bad things to each other, and that the majority of humankind only cares about themselves. But we’re here to tell you that this is not the case! There are countless examples of selfless people doing kind deeds for others, helping out those less fortunate than themselves out of the goodness of their hearts, with no expectation of payment or reward. Whether it’s providing a hungry person with a hot meal, engaging a stranger in conversation, or making sure a homeless person has the proper attire to stay warm on a cold winter night, these stories melt our hearts and remind us that people can be incredibly good and kind. We look up to these altruists, and hope the world can learn from the examples they set every day. Most of the time, these compassionate people don’t expect to be photographed, and usually aren’t looking for recognition. 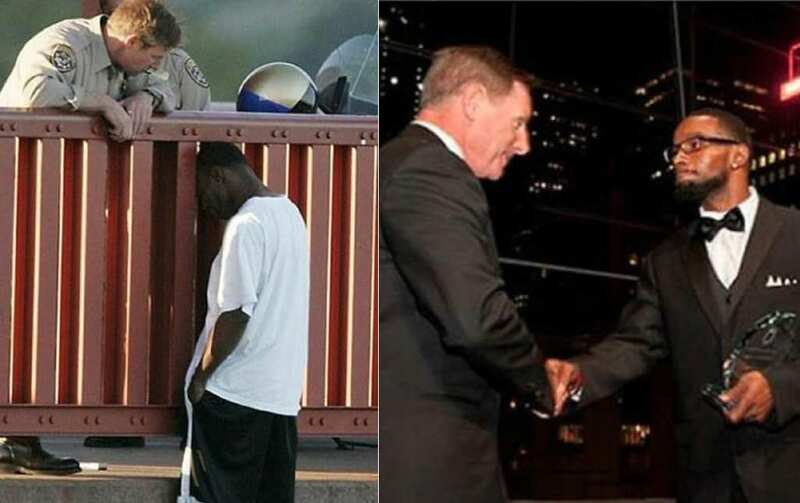 But when they are caught on camera, it serves as a reminder that good does exist in the world. Here are some of the photographs of amazing acts of kindness that restore our hope for the future of humankind. And don’t worry if you shed a tear or two – we certainly did! Elite Kenyan marathon runner Jacqueline Nytepi Kiplimo had a good chance of winning the 2010 Zhengkai International Marathon in China. But 10 kilometers into the race, she came across a runner with no arms, who was severely dehydrated. 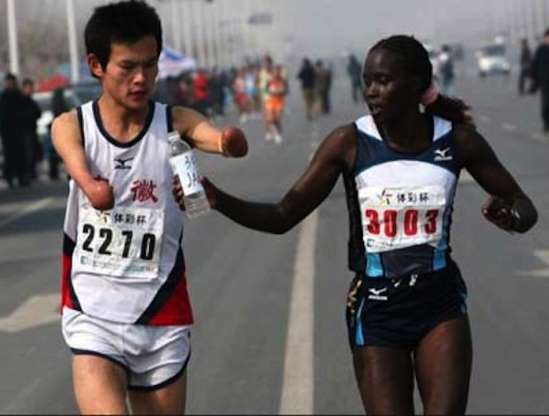 The man could not grab bottles of water to drink, so he needed help if he was to finish the race. Instead of speeding by, Kiplimo slowed down, running next to the man to hold water bottles for him as he drank. Kiplimo remained next to the runner until the 38-kilometer mark, after which he could finish alone. The good deed cost Kiplomo her win, and she came in second, but we’re sure it was worth it. What a true champion! In 2012, superstorm Sandy slammed into the Atlantic United States, causing severe damage in New Jersey and New York. Millions of people were left without power, rendering them unable to charge their cell phones to get in touch with their loved ones. The family who lived in this home was lucky, and their power remained on. So they did an incredibly kind and selfless deed and ran cables from their house into the street, offering to share their electricity with their neighbors. 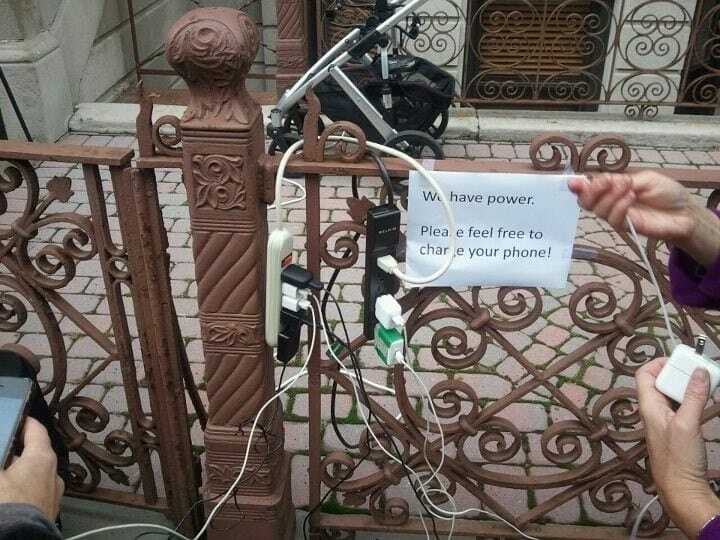 The grateful people of the neighborhood were thus able to charge their devices and use their cell phones, and the generous family made many people’s day in spite of the storm. 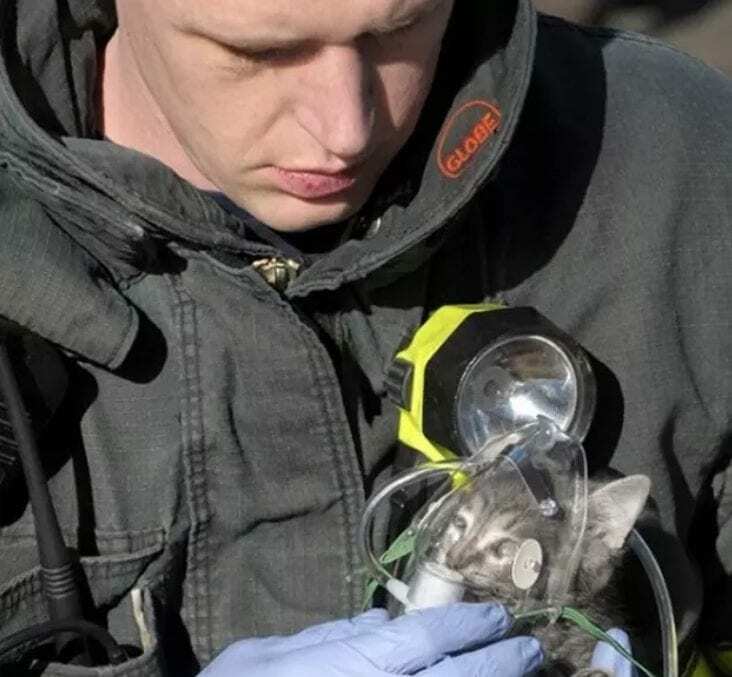 This picture of a firefighter holding an oxygen mask over a tiny kitten’s face is almost too cute for us to handle. The kitten needed oxygen after inhaling smoke in a house fire, and the firefighter was quick to come to its rescue. He held the little creature so carefully while administering first aid. Humanity can also be judged by how we treat animals, and the huge amount of concentration and effort that this man put into saving the little kitten’s life gives us hope for a better future. It’s no fun to eat lunch in a school cafeteria alone. 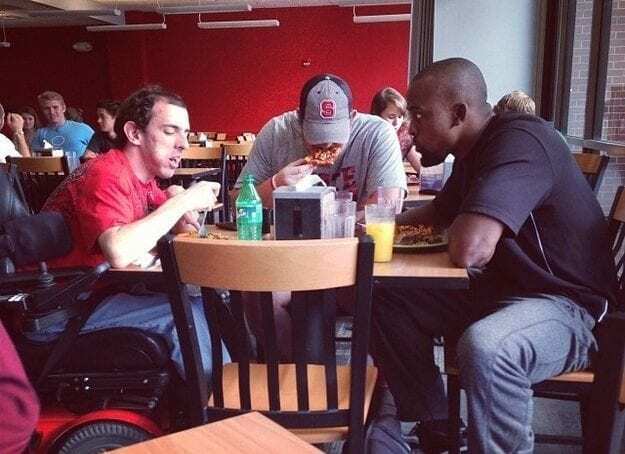 These two North Carolina State football players knew that, so when they noticed a fellow college student sitting by himself during lunch, they wanted to help him out. Even though there were plenty of other seats in the cafeteria, they decided to join him at his table. Then, they proceeded to brighten his afternoon by chatting with him, asking about his day and making sure he enjoyed his lunch. What a kind gesture! These two me – dressed as elves! – were caught on camera spreading holiday cheer to one of the less fortunate members of their community. 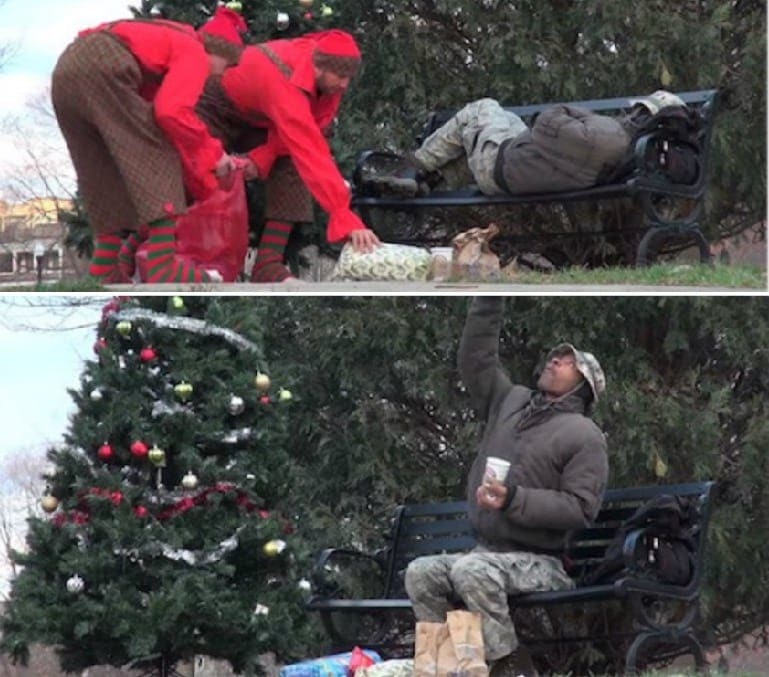 When they came across this homeless man sleeping on a bench, they quickly and quietly decorated a tree, set out gifts, and left him hot coffee and breakfast. When the impoverished man woke up, he could not believe his eyes – he thought he was going to spend the morning hungry. What a wonderful holiday surprise! The owner of this small bookstore in Wheeling, West Virginia does their best to make sure that everyone who wants to read gets the chance to do so. 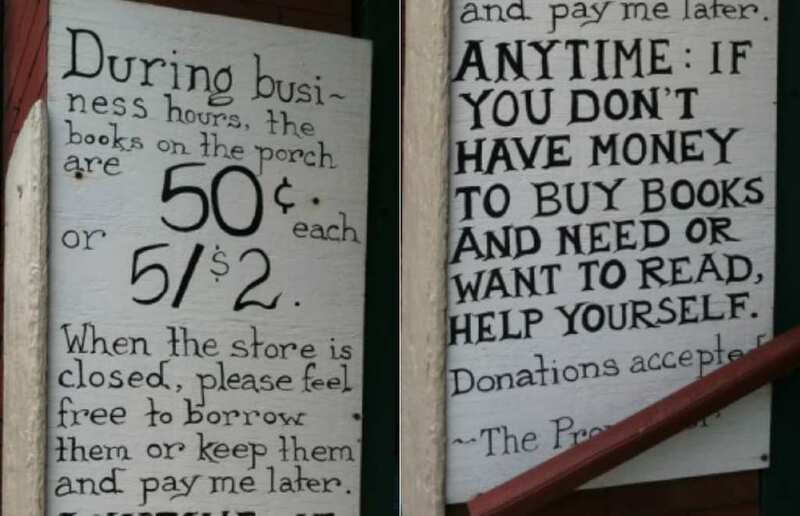 They hung this sign outside their shop, inviting people to take books from the porch, even when the store is closed. Not only that, they don’t mind if people who can’t afford to pay for the books take them anyway. This kind and generous person truly is a role model for the rest of us. Sometimes, children are the ones who give us the most hope for the future. 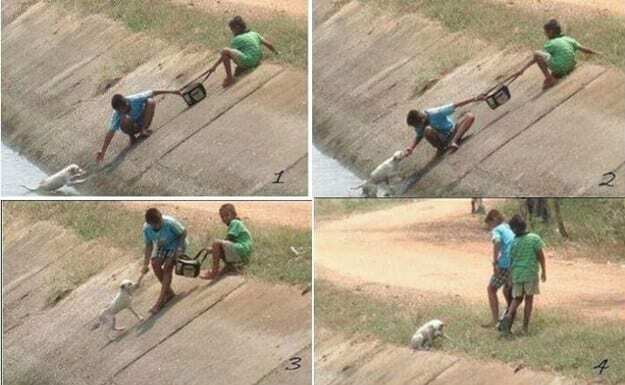 These two young boys saw a dog stuck in a ravine, and instead of continuing on their way, they felt it was their duty to help out. The boys worked together, creatively forming a chain using the bag they were carrying, and stretched down to grab the stuck pup. They were successful in their joint rescue effort, and the tired but grateful dog was saved. Sometimes, unemployed people have a special challenge when they interview for a job. If they don’t have enough money to clean their dirty clothes, they can give potential employers a negative impression, and miss out on employment opportunities. 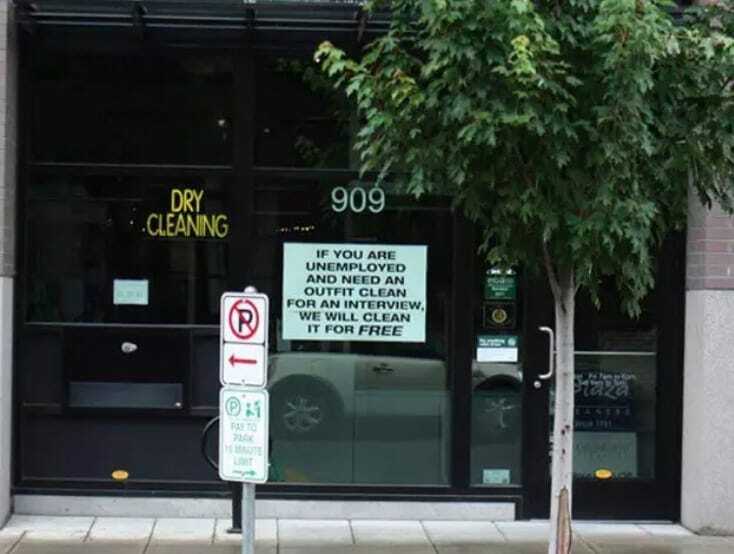 This dry cleaner had an idea to help them out: offer free cleaning services to unemployed people before their interviews, a service that can mean the difference between getting a job and being rejected. This idea is not just kind – it can change people’s lives! Police officers tend to get a bad rep when it comes to their interactions with homeless people, but a tourist caught this New York City police officer in an incredible act of kindness: he gave a barefoot man living on the street thermal socks and warm boots on a freezing cold New York evening. 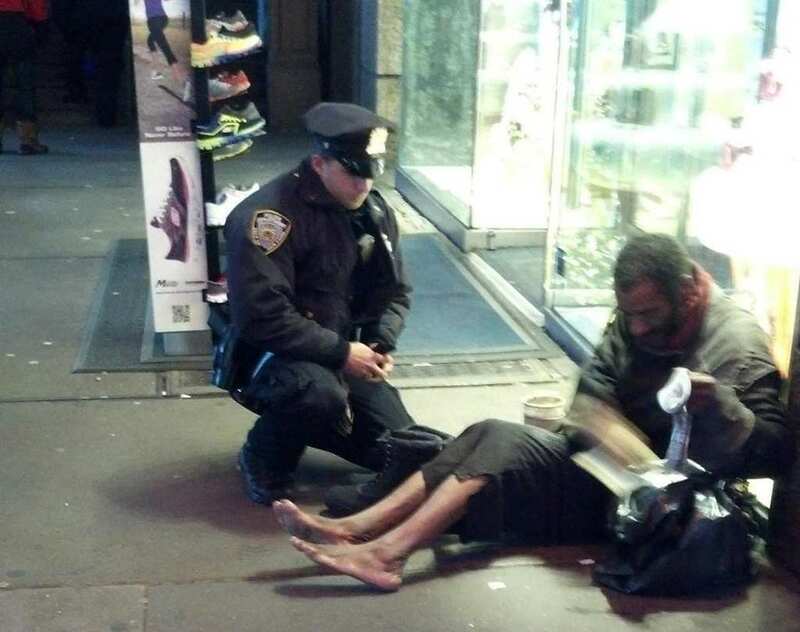 In this heartwarming picture, the officer kneels next to the man as he pulls out his new socks. This small good deed definitely made the man’s night much warmer and brighter! 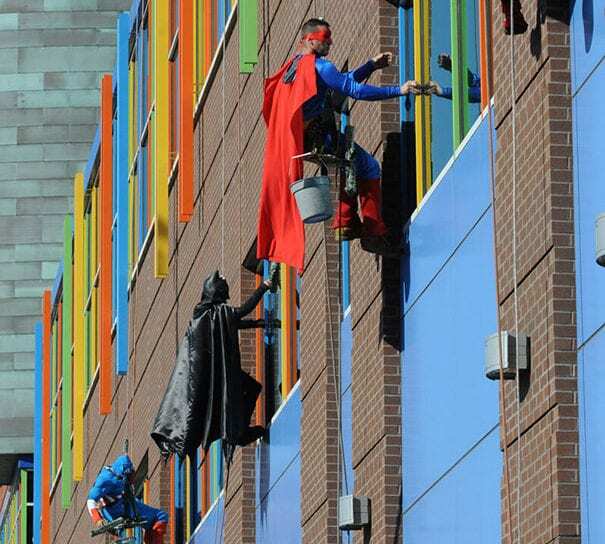 In cities across the world from Memphis to Sao Paulo, window washers at children’s hospitals are dressing up like superheroes. When the children look out of their shiny clean windows, they’re greeted by Superman, Spiderman, Batman, and all of their favorite comic book stars. What better way to distract the children from their injury or illness and add a ray of hope to their day? We love this idea and think these window cleaners are the true heroes. Protests can often get violent, and are sometimes the scene of brutal confrontations between the military and protesters. This story is different. During a protest in Brazil in 2013, a general asked the protesters to please refrain from fighting, because it was his birthday. The protesters listened, but then went on to do something completely unexpected: they surprised him with a birthday cake! The gesture brought tears to the general’s eyes. 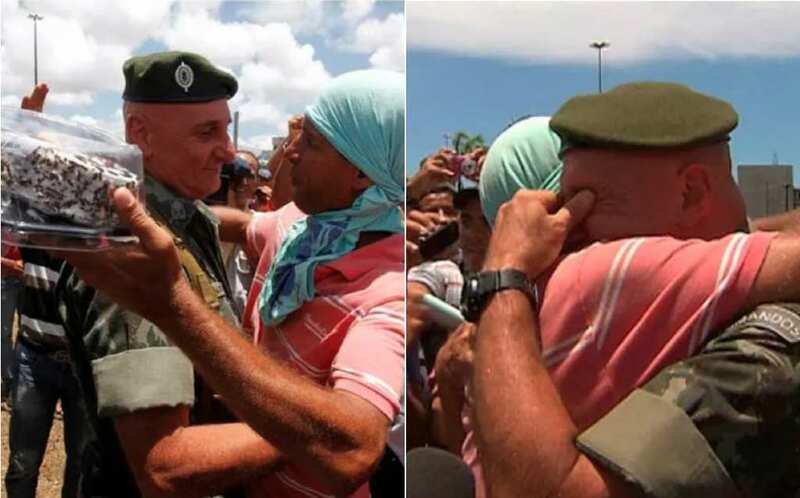 This picture of the general hugging a protester is incredibly moving and shows us that hope can be found even in the most unusual of places. The kindness of strangers can create strong bonds between people who otherwise would never meet. 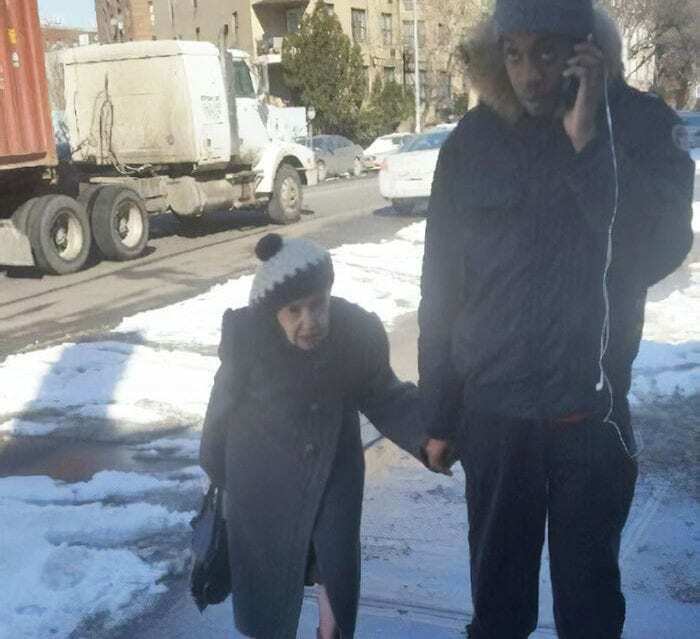 One frozen winter’s day, this elderly woman was afraid to cross the street because she didn’t want to slip on the ice. She approached this young man and asked for his help. He agreed, and did so again the next icy day, and the next. Now, he helps her out all the time, and the two have become close friends, often spotted walking hand-in-hand down the street. Kevin Berthia, a father of two, was going through a rough time. His baby daughter was born premature, and he was deep in debt due to medical expenses. He felt hopeless and made his way to the Golden Gate Bridge, questioning whether he even had a reason to live. Then, California Highway Patrol officer Kevin Briggs came across the agitated Berthia. Briggs stood on the bridge, talking to Berthia for an hour, convincing him that his life was worth living and saving his life. Briggs was later honored for his kindness at a ceremony, where he was also reunited with Berthia. A young man was sitting at the train station, trying and failing to tie his tie. He was dressed in his best clothes, on his way to an important event. An elderly woman noticed his struggle and enlisted the help of her husband. Without question, the man offered his assistance, bending down and tying the tie. 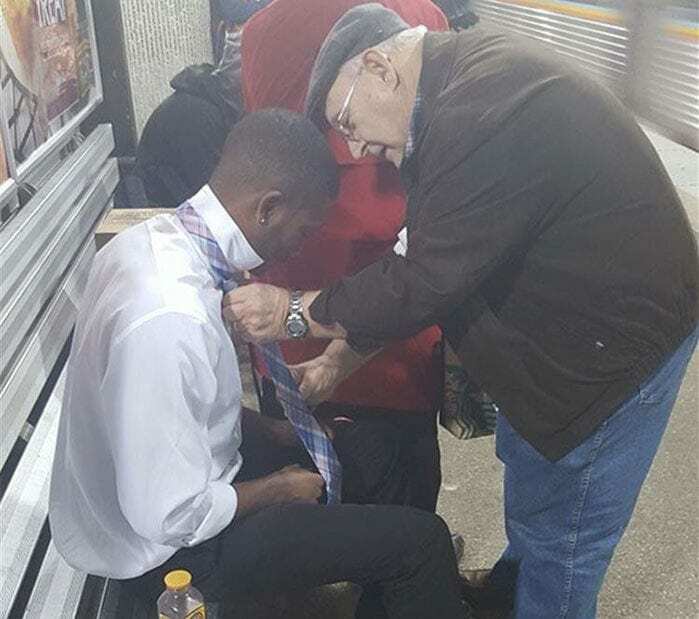 This small act of kindness definitely made the young man’s day better, and we hope other people waiting for the train learned from these role models. Homeless people often struggle to figure out where to get their next meal. In some cities, there are shelters that can help, while in others, it’s more difficult. But we didn’t expect a fast food restaurant would be the one to offer aid! 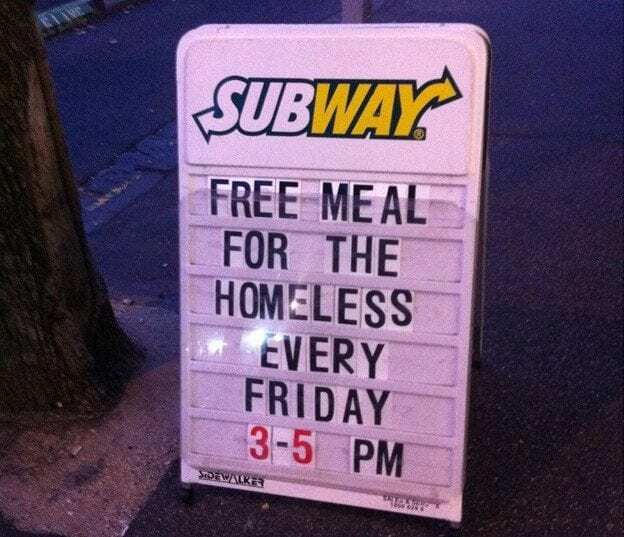 This Subway sandwich shop melted our hearts with their offer of free meals for the less fortunate every single day. What an incredible idea – we hope it spreads to more restaurants that can afford to do such things! This story is so wonderful it’s hard to believe! A woman, after divorcing her husband, was waiting tables in a small town, unable to make enough money to travel or move elsewhere. One day, she spoke with a stranger about her dream to take a trip to Italy, where her ancestors were from. The man paid his bill and walked out, without a word. 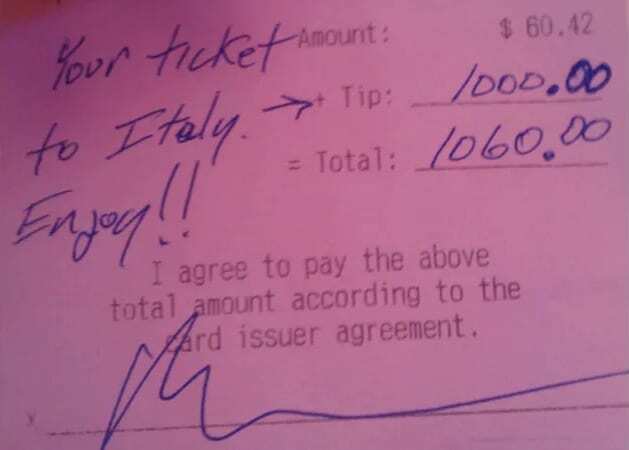 But when she looked at the bill, she saw something extraordinary: he had tipped her $1,000 to pay for her trip to Italy! If this doesn’t bring tears to your eyes, we don’t know what will. During a heat wave, our dogs can be the ones who suffer the most. If they have to be outside in the sun all day with their thick coats, it can get brutally hot. So this kind person decided to take matters into their own hands. 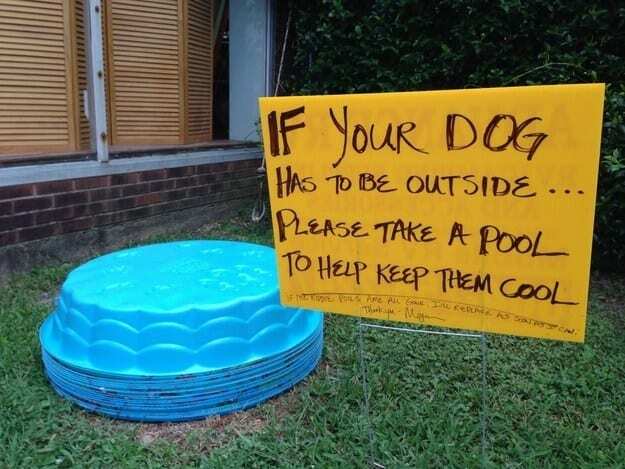 They purchased a stack of kiddie pools and gave them out for free, in order to keep the neighborhood dogs cool. This is not only kind, it’s a real lifesaver! This man saw a homeless girl walking barefoot in Rio de Janeiro, and felt that he had to help her. He selflessly took off his flip-flops and gave them to the girl, protecting her feet from the hot pavement. He was willing to go without in order to make her more comfortable. And why not, when it was so easy for him to go buy another pair? This gesture seems, which brought the girl to tears, is so simple and yet so incredibly kind. Mark Bustos is a New York City hairstylist who works in an upscale salon. 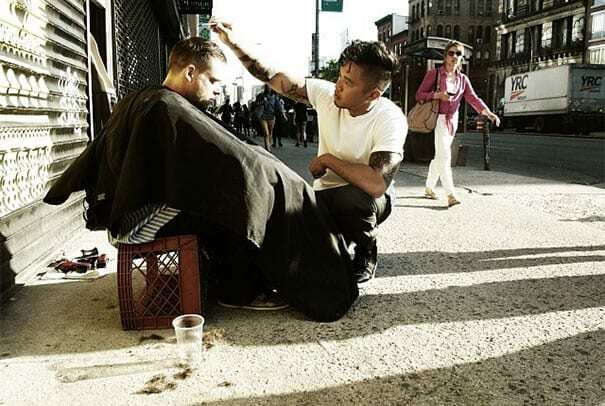 But he spends his days off in an unusual way: giving free haircuts to the homeless. In a city where most people don’t even look twice at the people on the street, this kind deed can make all the difference, raising their self esteem and making them look presentable for prospective job interviews. This man is a true hero! This young girl has her priorities straight. While many children save up their money to buy themselves something they’d personally enjoy, she sold her own toys to help some animals in need. She sold her stuffed animals, raising $40, which she donated to an animal shelter in order to secure “real animals,” as she called them, better care. 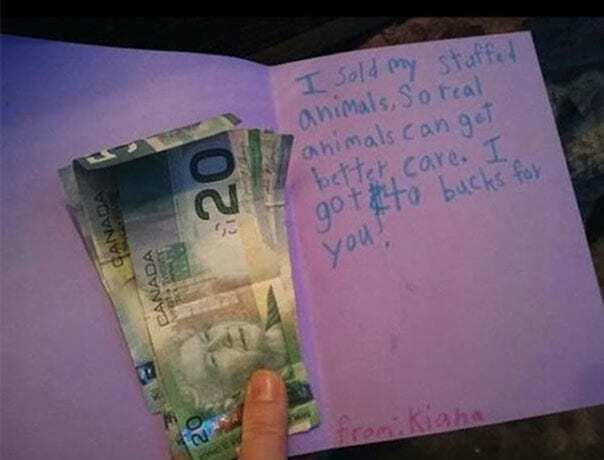 She sent the money to the shelter along with a sweet card, and we think many adults could learn a lesson or two from this inspiring youngster!